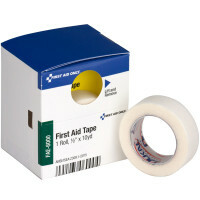 Unitized Medical First Aid Tapes: Surgical Tape & Medical Tape for First Aid Needs in unit boxes. Adhesive and First Aid Tapes are Transparent and Porous, yet Durable enough to secure Catheters, Tubing and Dressings. Available in various trays and rolls. These first aid tapes are packaged in ANSI color code compliant single unit boxes for convenient storage in unitized first aid kits. 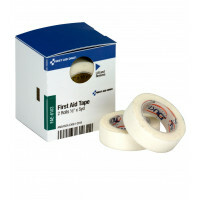 Available as first aid refills or stand-alone first aid tape needs. 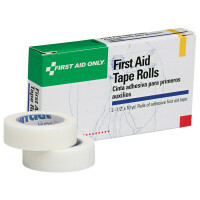 Adhesive Medical First Aid tape is one of the most versatile of all first aid kit supplies. One may use it to hold gauze in place or to help splint broken bones. 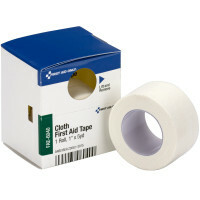 Adhesive Surgical First Aid tape is useful to cover blisters when moleskin is not available. Small strips of first aid tape can be used to hold lacerations together until the victim can get stitches. Surgical tape or medical tape is pressure-sensitive adhesive tape used in medicine and first aid to hold a bandage or other dressing onto a wound. These first aid tapes we offer have a hypoallergenic adhesive which is designed to hold firmly onto skin, dressing materials, and underlying layers of tape, but to remove easily without damaging the skin. They allow air to reach the skin ("breathable"). 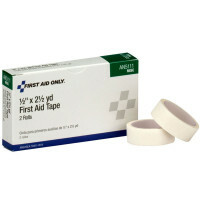 These First Aid Surgical tapes are white because they contains zinc oxide, which is added to help prevent infections. Some of our sports tapes are used to add a non-slip wrapping, such as tennis racquets, and hockey and lacrosse sticks, because of their rough texture and removability leaving little residue.